Over the last year, you may well have heard the word Hygge. This is the Danish way of living well. You have probably seen the word pop up more often in recent months whether in book shops, recipe books or social media profiles. Hygge decor and Nordic style is a perfect design theme for a lot of people that want to create a cozy and warm feeling in their home, Scandinavian curtains offer this opportunity. We want to share what we’ve learned about this movement and what the word means. You can then incorporate the Scandinavian interior design principles into your home from luxury curtains to scatter cushions. Hygge is a strange sounding word to us Brits and is often mispronounced. The biggest question from most people when they first see the word is “How do you pronounce Hygge?”. Due to it’s spelling it is a tricky word to get right without a bit of help from someone that is already in the know. We looked around and spoke to a few people living the lifestyle. The proper pronunciation of the word is “Hoo-gah” or “Hue-gah”. It is becoming increasingly popular and a more mainstream movement around the world. It’s been growing in popularity throughout the last year or so and is continuing to grow in popularity. Some say it translates to fun, others say it translates to cozy, calm or peacefulness. 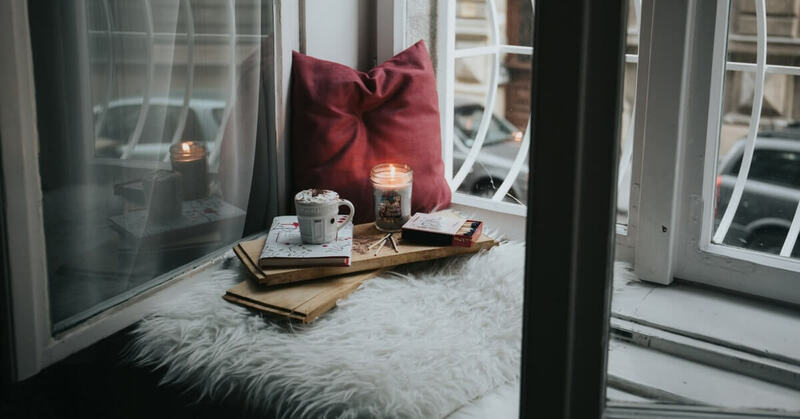 The theory behind Hygge has more to do with living the good life. It hasn’t got one specific meaning that we can translate exactly to English. This is essentially a way of life, it is comfort and togetherness, it is happiness and peace. Nordic style really is a lifestyle, a lot more that just a single word. Whether it is for the whole house or for a specific room. As such, it means something slightly different to each individual. As it grows in popularity more and more people are sharing the movement. There are bestselling books on Scandinavian interior design principles and ideas and Danish recipe books as well as a whole host of Pinterest boards and Instagram profiles out there for you to follow. It’s hard to define Hygge decor but Danish living is centred around family and friends and is all about the good life. The core belief is in finding joy through simplicity. For some, it could mean bubble baths. For others, it can have more to do with Hygge interior design. Hygge furniture and creating a cozy feel through Scandinavian curtains rugs and throws is another way to express your design roots. It is more about mindfulness and being present in the moment and simply spending time with family and friends. A typical Danish Hygge Scandinavian interior design principles for a living room will consist of minimal, comfortable furniture, along with thick faux fur throws and chunky knit cushions. There really is no question when it comes to deciding whether or not to take a few styling tips from the Scandinavian. Trust in their traditional tips on style and their lifestyle choices because Denmark has been found to be home to the happiest people in the world. You can start thinking about how to incorporate Danish Hygge decor into your home. Danish family life is all about snuggling up in big blankets and walking over giant fluffy rugs. These are only the tip of the iceberg when it comes to creating a Danish design for your home. Scandinavian design patterns and ideas for Scandinavian curtains and other textured accessories are not the only part of Scandinavian interior design principles. Reading things like The Little Book Of Hygge will guide you with a whole host of ideas on how to incorporate Scandinavian design into your home. You can create small nooks for peaceful reading. Scandinavian lighting with a few basic scented candles or a Scandinavian lamp can really add a sense of warmth and comfort. Snuggling up with the kids in a warm blanket with a hot chocolate, with natural coloured wood and natural textures. That is what creating the perfect environment to be at peace really is. That feeling, that emotion, that moment, that is how to create Hygge decor. These objects are what help to create Hygge Decor but at its core, it’s more than having “things”. It’s about simplicity. It’s about creating a sense of “home”, a feeling of warmth and comfort through Scandinavian interior design principles. There are a growing number of resources out there to help guide you. The best starting point is to follow some of the great Instagram profiles or Pinterest boards. From there you could pick up a book at your local bookstore.